Lori and her new (Scentsy) Buddy! I don’t know about you, but everyone once in a while I walk in to my kids’ room and I’m hit by a wall of some mystery smell that I can’t pinpoint. How can kids that are so cute, smell so bad? Well what do you do? You can’t light a candle, and I guess you COULD spray the heck out all their things with an air freshener or something but then what happens if they put one of those things in their mouths? That’s no good either. Well. Scentsy has come up with a solution. Scentsy Buddy. 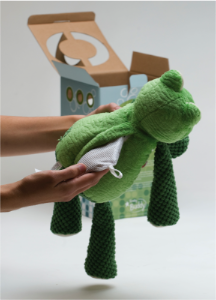 Scentsy Buddies are stuffed animals with a zipper pocket in the back which allows you to add a scent to it. I am usually very hesitant to get stuffed animals for my kids, cause I don’t want them to have TOO many of them, but I don’t consider Scentsy Buddies to be just any stuffed animal. It’s more than just a cuddly friend, it’s an air freshener, and depending on what scent you choose, aroma therapy (think calming lavender scent). Right now the scent packs come in 15 AMAZINGLY vibrant scents Berry Blush, Black Raspberry Vanilla, Camu Camu, Cucumber Lime, French Lavender, Havana Cabana, Hemingway, Mochadoodle, Perfectly Pomegranate, Pima Cotton, Satin Sheets, Sunkissed Citrus, Sweet Pea & Vanilla, Vanilla Cream, and Vanilla Suede. And the best part is, they are interchangeable! So if you, or your child, want a different scent, just contact your Scentsy consultant for another one! For more information contact Chilly. You will not be disappointed, nor will your kids! OH, and an added bonus... the box had handles, windows and a door that pop out, turning it into a house! Lori LOVED that part!